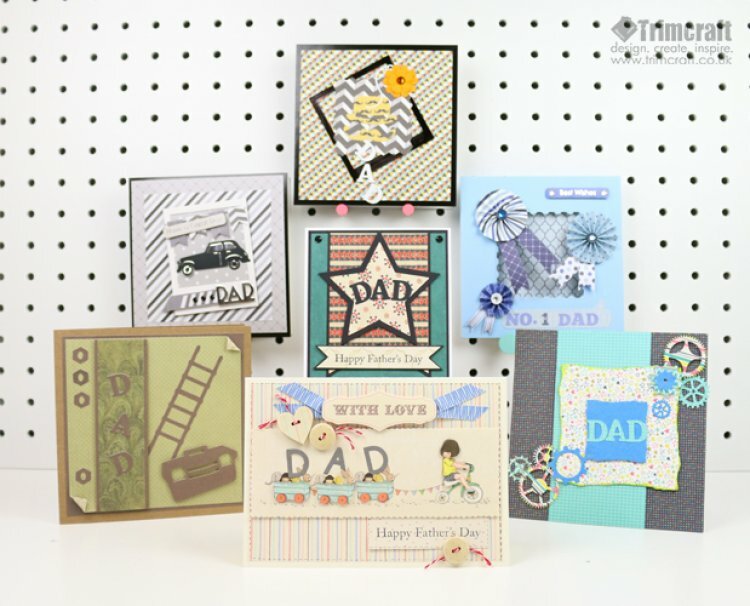 Each card should take you a short amount of time to whip up so have a look at what our brilliant design team have been crafting below and see if it sparks some ideas for your own Father’s day project! 1. Trim your Dovecraft 6x6 card blank down to 12cm wide, with the fold at the top. 2. Take the green sheet from the First Edition Moroccan Spice 6x6 paper pad and cut it down to 11cm x 13.5cm and layer it onto a 11.5cm x 14cm piece of Dovecraft black card, adhere this to the centre of your card blank with glue. 3. Find a patterned sheet within the Moroccan spice pad and cut it down to 8cm x 11.5cm. To create the banner, measure 3cm vertically from the bottom in the centre and make a mark. Cut diagonally from the left hand and right hand side to this point. Follow the same step on a piece of 8.5cm x 12cm Dovecraft black card. Layer on your patterned sheet and adhere your finished banner to the top of your card, in the centre. 4. Draw out a star that is 10cm x 8cm onto a sheet of Dovecraft black card and cut out. Next, draw an 8cm x 8cm star onto the back of a coordinating Moroccan Spice sheet, cut out and glue it to the centre of your first star. Adhere this toward the top of your card, in the centre with 3D foam tape. 5. Die cut the word ‘DAD’ onto a sheet of Dovecraft black card and adhere the sentiment in a curved shape, across the centre of your star. 6. Cut a 1.7cm x 10cm strip of beige, patterned paper from the Moroccan Spice pad and using the Dovecraft Clear Stamp Set- Sentimental; stamp the ‘Happy Father’s Day’ phrase across the middle of your strip. Once dry create the banner shape by following step three, but only measure 1cm in. 7. Cut a 2cm x 10.5cm strip of Dovecraft black card and create the same banner shape as before. Glue your sentiment to the middle of your card and add it to the bottom of your large banner on the card. 8. Finish by colouring in four, Simply Creative clear gems with the First Edition black marker and adhere one in each corner of your card. 1. Take a card blank and a piece of patterned paper from the Dovecraft Monochrome Goody Bag. Cut your paper down to 14.5cm x 14.5cm and glue it to the centre of your card. 2. Choose a coordinating sheet from the Dovecraft Monochrome Goody Bag and cut it down to 12cm x 12cm. Layer this in the centre of your card with glue. 3. Find the polka dot sheet within the goody bag. Adhere a Dovecraft frame on top of the sheet and carefully cut around the edge with a craft knife. 4. Take the car from the First Edition Transport die set and diecut it onto a sheet of First Edition black textured card stock and on a sheet of Dovecraft Mirror card. Add a few strips of Dovecraft Perma Fix tape to the back of the car and fill in the gaps with the die cut mirror card. Once complete, adhere the car to the centre of your frame with 3D foam pads. 5. Cut a 12cm length of Dovecraft twine and wrap it around the top of the photo frame, adhering the ends to the back with Dovecraft Perma Fix tape. Cut 4 small flag shapes from a variety of patterned sheets within your goody bag, ensuring to give each one a fishtale end. Add them across your twine with 3D foam pads. 6. Take the ‘Have a Great Day’ sentiment from the goody bag and stick this across the banner. Using the First Edition Male Sentiments dies, die cut the word ‘DAD’ onto the leftover sheet of Dovecraft Mirror card and stick it with 3D foam pads to the bottom right corner of your frame. 7. Cut a 5.5cm x 1.5cm strip of paper and a 3.35cm x 1cm strip of coordinating paper. Cut off one edge diagonally on both. Layer the smallest strip to the biggest with glue, on the right hand side. 1.Cut a 17.1cm x 12.1cm piece of striped paper from the Belle and Boo 8x8 paper pack. Use a black pen to create a faux stitch around the edge. Adhere your paper to the centre of your Dovecraft cream 5x7 card blank, ensuring that the fold is at the top. 2. Next, cut a piece of spotty paper from the Belle and Boo paper pack down to 8.1cm x 2.6cm. Stamp the ‘Happy Father’s Day’ sentiment from the Dovecraft Clear Sentiment Stamps collection and as before, create the faux stitch look around the edge. Once complete, adhere 1.5cm up from the bottom right corner. 3. Take the no. 1 image of Belle on her tricycle in the Belle and Boo Decoupage pad and 16 scallops in from the left, cut the image in two. Keep the left side piece and remove the glittered edge by cutting around the scallops. Take the no. 2 decoupage image and 29 scallops in from the right, cut the image into two, keep the right side piece. 4. Connect the left and right piece by lining it up on top of a strip of 3D foam tape. Add a few more 3D foam strips to the back of your decoupage image and stick it to the centre of your card. 5. Add an extra crate of toys to the middle of the two crates. Share out the decoupage extras across the three crates and Belle to add dimension. 6. Die cut the word ‘DAD’ from the First Edition Alphabet dies onto a sheet of grey, First Edition Textured card stock. With glue, add a letter above each of the crates, at an angle. 7. Create the ‘With Love’ decoupage sentiment using 3D foam pads. Cut four pieces of blue stripy, Belle and Boo ribbon at 4.5cm. Cut the edges at an angle, and add two pieces either side of the sentiment with Dovecraft Perma Fix tape. Add your finished sentiment to the top of your card. 8. Take a heart and circle shaped wooden Belle and Boo button, thread through a small length of Dovecraft twine in each. Tie at the back and add them to the bottom left of the sentiment with Dovecraft Perma Fix tape. Dovecraft Back to Basics Blue Skies 6x6 Paper Pack, Cards & Envelopes, Accordion Stickers, Sentiment Toppers, Gems & Garland Flags. 1. Take your Dovecraft Back to Basics Blue Skies 6x6 card blank. Open it up with the fold at the top. Carefully Tape the 3rd largest First Edition Nesting die to the centre and put it through your die cutting machine. 2. Adhere a navy piece of paper from the Back to Basics Blue Skies paper pack to the inside of your card, in the centre. 3. Take the largest die from the First Edition Nesting dies and die cut it onto a lighter coloured sheet from the Blue Skies collection. Layer this on top of your first sheet, in the centre. 4. Use the First Edition Alphabet dies to create the sentiment, ‘No.1 Dad’. Use a different paper design for each letter to add interest. Die cut a speech bubble from the First Edition Speech Bubble set onto a Blue Skies sheet of paper. 5. Layer your sentiment onto your speech bubble with glue. Once complete, add your finished sentiment toward the bottom right of your card. Add the ‘Best Wishes’ sentiment from the Blue Skies collection toward the top right of the card. 6. Choose 2 large and 1 small accordion sticker from the Blue Skies collection and spread these around the die cut in the middle of your card. To create a ribbon effect, add two garland flags from the Blue Skies collection and glue them to the bottom of each rosette. 7. To finish, add two clear Simply Creative gems either side of the ‘Best Wishes’ sentiment and add a different coloured gem to the middle of each rosette for interest. 1. Begin by trimming down a sheet of Simply Creative My Guy 6x6 paper down to 14cm x 14cm. Glue this to the centre of your card. 2. Turn over your Back to Basics Blue Skies photo frame and colour it in with your First Edition black pen. Once dry glue this at an angle, in the centre of your card. 3. Take the 3rd largest die from the First Edition Pinking Edge Nesting die set and die cut it onto the monochrome patterned sheet in the My Guy paper pad. Glue this on top of your frame, in the centre. 4. Using the First Edition Vintage Gentlemen dies, die cut the top hat, moustache and pocket watch onto the moustache repeat design paper from the My Guy paper pad. Stick the top hat in the middle and the die cut moustache just underneath. 5. Flip the pocket watch so that it is white side facing up and glue this onto your card, ensuring to overlap the top hat and photo frame. 6. Take two paper flowers from the Simply Creative Yellow paper blossoms collection, layer one on top of the other and add a Simply Creative orange gem in the middle. Glue the finished blossom to the top right of your photo frame. 7. Use the First Edition Alphabet dies to spell out ‘DAD’ onto a sheet of Simply Creative My Guy paper. You will want to glue these down white side facing up, vertically but ensuring to adhere each letter at an angle to appear as if the sentiment is falling off the card. 1. Take the dotted sheet from the First Edition Pick n’ Mix 6x6 paper pad and glue it down to the front of your Dovecraft Kraft card blank. 2. Find the turquoise sheet in the First Edition Pick n’ Mix paper pad and cut it down to 7.5cm in width. Adhere this to centre of your card, vertically. 3. Use the 3rd largest die from the First Edition Torn Edge Nesting die and cut it onto the glittered, star sheet from the Pick n’ Mix paper pad. Colour the edge in with a yellow highlighter pen to add interest. Stick your finished die cut to the centre of your card with 3D foam squares. 4. Die cut the smallest die from the First Edition Torn Edge Nesting die set onto a sheet of blue, First Edition Textured card stock. Add this to the centre of your first die cut with 3D foam pads. 5. Die cut a selection of the First Edition Cogs onto a variety of First Edition Pick n’ Mix paper designs. Adhere these to the bottom left and top right of your card with glue and 3D foam pads to vary your design. 6. Use the First Edition Serif Alphabet die set to create the ‘DAD’ sentiment. Die cut these letters onto your chosen Pick n’ Mix sheet and add this to the centre of your smallest Torn Edge die cut. 1. Find the green spotty sheet within the First Edition Falling Leaves 6x6 Paper Pad and cut it down to 13.5cm x 13.5cm. Carefully roll the top right hand corner and the bottom left hand corner. 2. Toward the back of the First Edition Falling leaves pad, you’ll come across sheets of brown paper. Take a sheet and cut it down to 14cm x 14cm. Layer your spotty sheet on top of this and then glue your layered sheets to the centre of a Dovecraft Kraft card blank. 3. Cut a 3.5cm x 13.5cm strip of green, patterned paper from the First Edition Falling Leaves paper pad. Next, cut a 4cm x 13.5cm strip of brown paper found within the Falling Leaves pad. Layer your green sheet onto your brown strip in the centre, so that you’re left with a nice border. Add 3D foam pads to the back of your layered strips and add them 3cm in from the left hand side at the front of your card. 4. To coordinate with the rest of the design, die cut the word ‘DAD’ using the First Edition Serif Alphabet dies onto the brown paper as before. On the same coloured sheet, use the First Edition Tool dies and die cut the tool box, the ladder and four nuts. 5. Glue the ‘DAD’ sentiment vertically; positioning each letter at a slight angle down the layered strips. 6. Glue 3 of nuts vertically, toward the top left of the card and one toward to bottom left. Stick down the ladder at an angle on the right hand side of your sentiment. Add 3D foam squares to the back of your tool box and add this underneath your ladder.